Construct a quadrilateral ABCD, in which AB = 6 cm, BC = 4 cm, CD = 4 cm, ∠B = 95° and ∠C = 90°. Step I: Draw BC = 4 cm. Step II: Construct ∠ABC = 95° at B. Step III: With B as the center and radius 6 cm, cut off BA = 6 cm. Step IV: Construct ∠BCD = 90° at C.
Step V: With C as the center and radius 4 cm, cut off BA = 4 cm. The quadrilateral so obtained is the required quadrilateral. 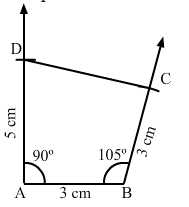 Construct a quadrilateral ABCD, where AB = 4.2 cm, BC = 3.6 cm, CD = 4.8 cm, ∠B = 30° and ∠C = 150°. Step I: Draw BC = 3.6 cm. Step II: Construct ∠ABC=30° at B. Step III: With B as the center and radius 4.2 cm, cut off BA = 4.2 cm. Step IV: Construct ∠BCD=150° at C.
Step V: With C as the center and radius 4.8 cm, cut off CD = 4.8 cm. 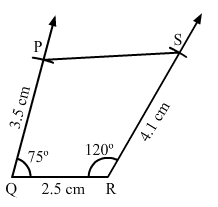 Construct a quadrilateral PQRS, in which PQ = 3.5 cm, QR = 2.5 cm, RS = 4.1 cm, ∠Q = 75° and ∠R = 120°. Step I: Draw QR = 2.5 cm. Step II: Construct ∠PQr=75° at Q. Step III: With Q as the center and radius 3.5 cm, cut off QP = 3.5 cm. Step IV: Construct ∠QRS=120° at R.
Step V: With R as the center and radius 4.1 cm, cut off RS = 4.1 cm. 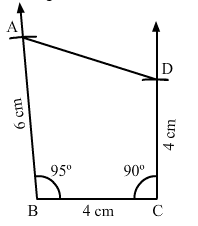 Construct a quadrilateral ABCD given BC = 6.6 cm, CD = 4.4 cm, AD = 5.6 cm and ∠D = 100° and ∠C = 95°. Step I: Draw DC = 4.4 cm. Step II: Construct ∠ADC=100° at D.
Step III: With D as the center and radius 5.6 cm, cut off DA = 5.6 cm. Step IV: Construct ∠BCD=95° at C.
Step V: With C as the center and radius 6.6 cm, cut off CB = 6.6 cm. 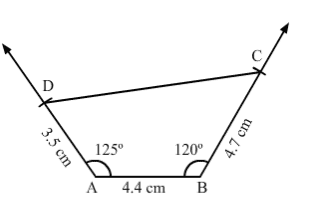 Construct a quadrilateral ABCD, in which AD = 3.5 cm, AB = 4.4 cm, BC = 4.7 cm, ∠A = 125° and ∠B = 120°. Step I: Draw AB = 4.4 cm. Step II: Construct ∠BAD = 125° at A. Step III: With A as the centre and radius 3.5 cm, cut off AD = 3.5 cm. Step IV: Construct ∠ABC = 125° at B. Step V: With B as the centre and radius 4.7 cm, cut off BC = 4.7 cm. Construct a quadrilateral PQRS, in which ∠Q = 45°, ∠R = 70°, QR = 5 cm, PQ = 9 cm and RS = 7 cm. Step I: Draw QR = 5 cm. Step II: Construct ∠PQR=45° at Q. Step III: With Q as the center and radius 9 cm, cut off QP = 9 cm. Step IV: Construct ∠QRS=90° at R.
Step V: With R as the center and radius 7 cm, cut off RS = 7 cm. 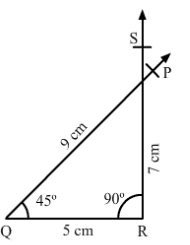 Since, the line segment PQ and RS intersect each other, the quadrilateral cannot be constructed. 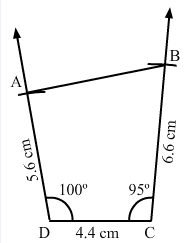 Construct a quadrilateral ABCD in which AB = BC = 3 cm, AD = 5 cm, ∠A = 90° and ∠B = 105°. Step I: Draw AB = 3 cm. Step II: Construct ∠DAB=90° at A. Step III: With A as the center and radius 5 cm, cut off AD = 5 cm. Step IV: Construct ∠ABC=105° at B. 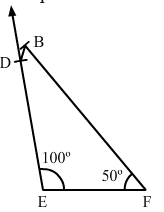 Step V: With B as the center and radius 3 cm, cut off BC = 3 cm. Construct a quadrilateral BDEF, where DE = 4.5 cm, EF = 3.5 cm, FB = 6.5 cm, ∠F = 50° and ∠E = 100°. Step I: Draw EF = 3.5 cm. Step II: Construct ∠DEF = 100° at E.
Step III: With E as the center and radius 4.5 cm, cut off DE = 4.5 cm. Step IV: Construct ∠EFB = 50° at F.
Step V: With F as the center and radius 6.5 cm, cut off FB = 6.5 cm.